The decline of home cooking has become a trendy thing to complain about these days. If only more people would cook at home, the argument goes, we could begin to solve such national problems as obesity, diabetes, and the falling economy. But very little is being done to actually make that happen. Yes, Jamie Oliver taught 1,000 people how to cook in a week. But unless you happen to live in Huntington West Virginia, you are stuck with the commercials in between the shows. You know, the ones that claim Stouffer’s and Lean Cuisine and necessary to make healthy daily meals, because working with raw ingredients is too intimidating and best left to the professionals. There is a huge gap in general knowledge not only in the basics of cooking, but in how to store raw ingredients. People seem to fall into two extremes when it comes to veggie storage. There is the Seal Everything Tightly In A Ziploc Bag So It Doesn’t Get Contaminated camp and then there is the Throw Everything In The Fridge Exactly How It Came From The Store And Hope For The Best camp. And it’s no wonder there is such confusion. Meat and dairy products are the only foods that come with explicit storage instructions - instructions that make it sound like if you look at the ground beef in your fridge and think “salmonella,” the cells with magically begin to spawn. Then we have the likes of Food Network fridges that are always cascading with fresh vegetables, wholly intact down to the carrot tops waving at the camera, nary a bag in sight. 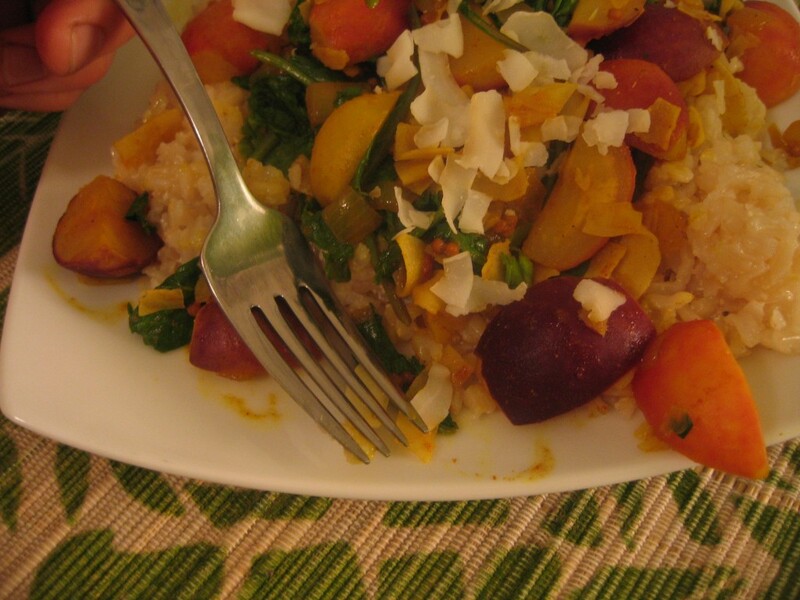 I learned an important lesson about radishes in making this curry: Radishes lose their zing when cooked. I know, who’d've thought, right? 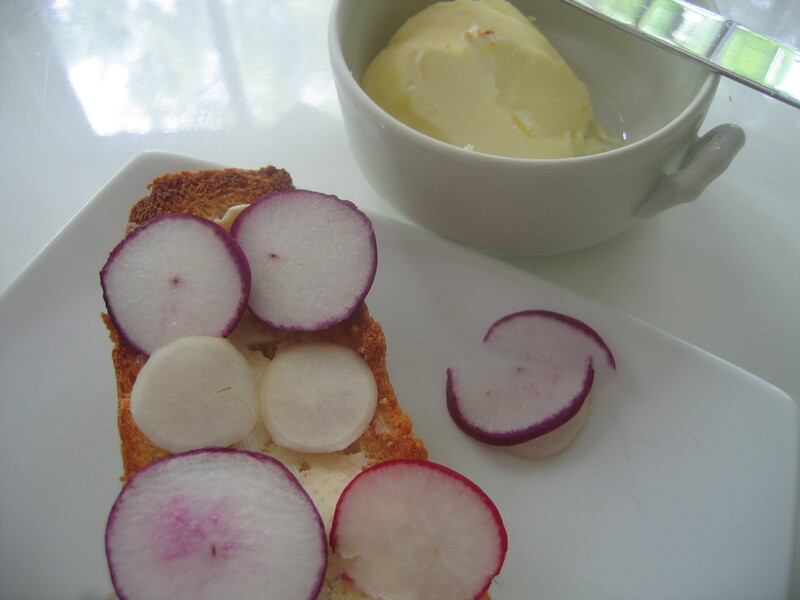 After our stellar brunch date of simple Bread and Buttered Radishes, this dish tasted flat. Kind of like . . . say you watch this really weird French movie with the Someone From the Checkout Line. You see the artistic styling of the plot, the authentically lame characters, and the poignant theme all wrapped in a beautifully rendered screen composition. This movie has explained a bit of yourself to you. Ready to have a deep meaningful conversation, you look over at the Someone . . . and he is texting. That’s what I mean by flat. I was expecting so much more, and there just wasn’t. However, I don’t think it’s necessarily the radish’s fault. I believe this dish can be improved to have all the complexity a curry ought to have. It’s just a matter of understanding. Let’s go back to the problem of the Someone and the French movie. If you resist jumping to conclusions (You useless human being! You’re not good for anything but passing the time in the check out line! ), you might find out that the Someone is nearsighted and couldn’t read any of the subtitles and therefore didn’t know what was going on since the first “bonjour.” So, take a minute to understand the radish instead of accusing it like I did (You useless vegetable! You’re not good for anything but bagged salad!). You see, what I didn’t realize was that radishes mellow out as they are cooked, taking on the flavor of whatever they are cooked in, much like tofu. Far from useless, this can be an appealing quality. Think of the possibilities. Radishes can now go in all kinds of things – from spaghetti sauce to jambalaya – without overpowering it. It just means you have to pay extra attention to the cooking medium, which I did not do for this dish. Having had my first real radish just this Friday, I felt it was necessary to spend some one on one time with the vegetable, without any distracting flavors. I was a little apprehensive, in the same way you would be if you had met Someone in line at the grocery store and decided to go out to dinner together. Sure, he’s charming now, but can he sustain hours-long conversation? Or will his wit just rub off like peach fuzz, leaving a tough leathery skin? I had similar concerns for the radish. I liked what I’d tasted so far, but then again, there’s very few things that would taste bad straight out of the field in the middle of a long hot day of farming. Kind of like how anybody could be charming compared to vapid magazine covers and bored check out clerks in a grocery line. Would my radishes be able to sustain their beguiling quality away from the farm? More importantly, would Mr. Quotidian like them? 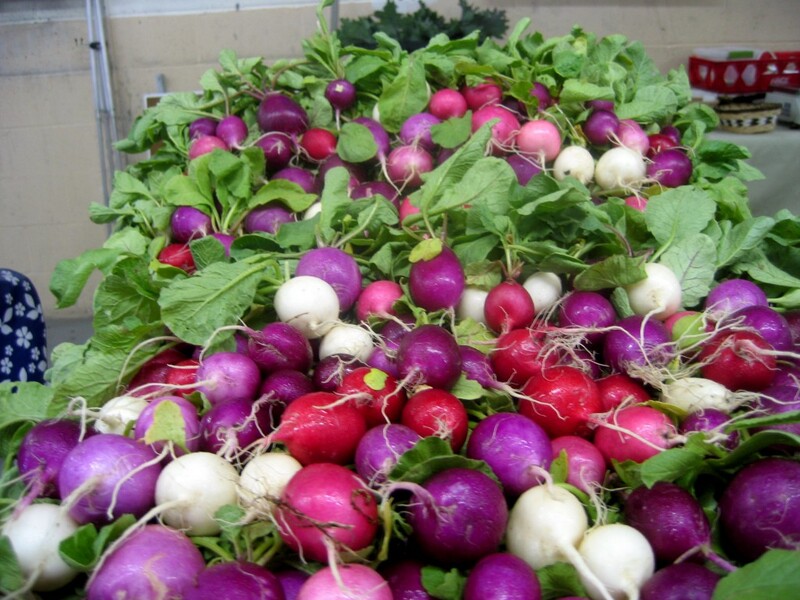 On Friday, City Roots harvested over 80 pounds of beauty in the form of these Easter Egg Radishes. We grew them alongside the carrots as a companion crop. Fast growing radishes help the slow growing carrots by keeping the soil from crusting over before they germinate and shading out most weeds with their leaves. They also help mark rows as carrot tops can be hard to see. As other volunteers brought in crate after crate of radishes for me to arrange, I began to feel like I was working in a candy shop. Such vibrant lollipop-like colors are usually confined to the air conditioned candy aisle at the supermarket, not a hot field. For awhile, I felt more like an artist than a farmer, lining the pearly white with the lipstick red and hanging the amethyst purple next to the blushed pink. A lady at the farmer’s market said the next day that they are pretty enough to put in a bowl as a centerpiece, forget about eating them. But I have to disagree. Something so beautiful deserves to eaten, not roll around in bowl till they’re old and wrinkly. All of my previous experience with radishes has been of the bagged salad variety. 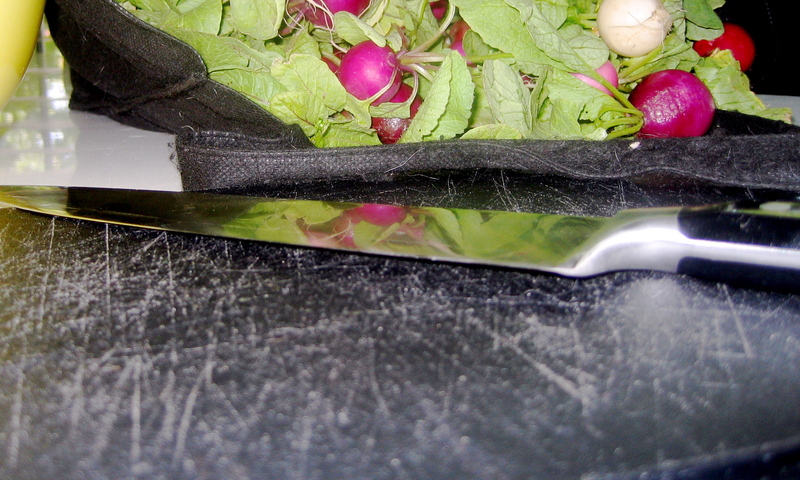 So, spurred on by the current beauty and abundance, I rubbed the dirt off of one and took my first bite of a real radish. True to their siren song of colors, my radish began as cool and enticingly crunchy as a cucumber. But then, once I’d committed and swallowed, it threatened to drown my adventure seeking taste buds in a fiery wasabi-like spiciness. I was hooked.